I am working on a longer post about “The Child Exchange”, Reuters exposé about the underground internet market in adopted children called ‘private re-homing’, and will publish something soon. However, I wanted to get the Adoption Policy and Reform Collaborative’s statement below into the blogosphere immediately. The need for a Dissolution Review Process (including adoption dissolutions resulting from child deaths) requiring greater oversight on adoption dissolutions. According to the Child Welfare Information Gateway, an estimated 10%-25% of adoptions are disrupted. There is a lack of state and national data, along with minimal data sharing tracking dissolutions (including child deaths). It is nearly impossible to find dissolution numbers, because adoption records were closed to the public and children’s names and identifying information were changed. The APRC is acutely aware of the unethical and dangerous “rehoming”* practices that have occurred for more than a decade. We have expressed our concerns with alarm. We look forward to collaborating, from the perspective of adult adopted persons, with other powerful change agents to fully, appropriately, and ethically address adoption disruptions and dissolutions. *Please note: while the APRC recognizes “disruption,” “dissolution,” “displacement” and “re-homing” as industry terms, APRC members regard these terms as sanitized and rationalizing practices terminating the parent/child relationship. While using industry vernacular in this statement we do not endorse their usage for the reasons indicated. An awesome adoption conference is happening this November. Will you be there? 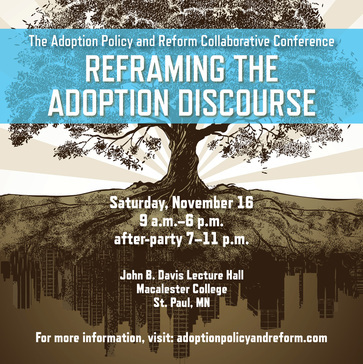 A group that I belong to, The Adoption Policy and Reform Collaborative (APRC) and the Minnesota Transracial Film Festival along with others, are organizing a two-day conference called “Reframing the Adoption Discourse,” in St. Paul, Minnesota this November. This is the APRC’s first conference and the line-up of presenters is impressive. There is also an ‘after-party’ on Saturday evening the 16th. Space is limited, so get your tickets today! Registrations are discounted until Sept 1. Here is the info you need to join us.